The Christmas-New Year week is almost upon us, which hopefully means you will be getting some R&R and/or seeing friends and family. We take a break here at Naked Capitalism too, since news flow also slows down at this time of year. Starting today, we are on reduced posting schedule. Through and including January 1, you will get Links plus two posts plus Water Cooler on weekdays when Lambert is in the mood (which is probably going to be every weekday but I think he should take some off). There are some good videos that haven’t gotten the attention they warrant, so we’ll be featuring them. I’m not sure if you’ll get a full or partial roster on January 2, since that depends on how rich or thin the informational pickings are. But we will be back to normal by January 3. We will also have a comments holiday of sorts. We promised to have two weeks a year of a break from comments. As much as we like all of you, and it seems lonely to put up a post and then not get any feedback, comments are stimulating, even when stimulating in a good way. We (meaning moi and our two comment minders, Outis and Jules) need some downtime. So comments will be off starting on Christmas Day through and including New Years Day. Well, almost off. We can’t even keep fully to our resolution not to hang out with you. Lambert will have comments enabled on his Water Cooler posts. So safe travels to all of you who will be on the road, and best wishes for the holidays, and for a healthy, happy, and prosperous 2018! We plan to make even more trouble! This entry was posted in Notices on December 22, 2017 by Yves Smith. For goodness sake, take as much time off as possible. I’m exhausted just watching you all work. Have a wonderful festive season, one and all. Amen to that. You’ve earned it. This right here! Everyone needs recharge sometimes. A vacation is great for the mind and soul. It puts things in perspective. Thanks to Yves and the crew for all your work. I’m thankful I have this site in my life. Thanks Yves for the wonderful and intellectually enriching work you and the team do, looking forward to more of the same in the new year. May it be a blessed holiday period for you and everyone here at NC. Happy holidays to all and thank you everyone for this excellent site and community! I think you should take a comment holiday more often, maybe once a quarter? In any case, we are grateful for NC and wish you a great break and holidays. How about quarterly gatherings during the comment breaks. Like meetups, only bigger. Yves, Lambert, Jerri-Lynn and crew: Happy Holidays and best wishes for the New Year. Thanks for allowing me to goof off, and enjoy your time away and happy holidays. Everyone, take a break! 2018 will be trying, and it will require much work. Happy Holidays to all! I couldn’t start the day, every day, without NC and everyone here. Thanks for taking some time off and happy holidays to all. Best wishes to all at NC for the holiday season. Without comments, I might be able to catch up on all the posts I haven’t been able to get to in the past couple of months. The NC archives are a great place to visit, just pick any random day back to it’s inception and I’m sure you’ll be pleasantly surprised. Naked capitalism is my favorite place in the world! Thanks to everyone for this comfortable home and all the best going forward. 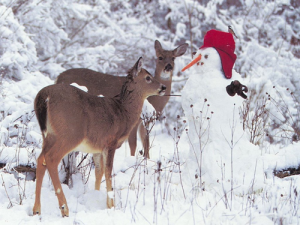 They’re looking hungrily at the snowman’s carrot nose. I suspect that a subsequent image would show it being eaten. Happy holidays Yves and crew! Enjoy family, friends, and some well deserved rest. Thanks for your hard work. And integrity. Cheers! Happy Winter holiday and new year. Thank you so much to Yves, Lambert, and the whole NC crew. I would not want to be facing this world without your voices, curated links and commentary. Enjoy a break, and thank you again! You are my go-to site every morning. Please take off however much long you want to. Merry Christmas and Happy New Year! Thanks for a wonderful year on #NC, Yves, Lambert, Outis, Jules, Jerri-Lynn et al!!! Really looking forward to more meetups and wonderful interactions with you all in the new year. I second every comment above. I’ve learned so much from the posts, links and comments. Thanks to all y’all for this excellent site. Thirded, or fourthed. NC you are the best! Merry Christmas every one! As long as you all keep thinking, commenting, compiling, our country/humanity will survive! Thank you for all your vowels and consonants! To echo the others – definitely happy holidays and a fun 2018 to boot. I’m happy to hear all at NC will take some down time for yourselves. We all need to rejuvenate when we can. I don’t always read everything timely enough to do much commenting these days, but coming here to read is an oasis of reality and useful information. I am so appreciative it is here and for all the hard work everyone does to keep it going. Happy holidays to all. If you’re back to normal by the 3rd, you’re among the happy few. Thank you for all the great work and great writing that you do! This site is my most trusted source for keeping myself informed. Enjoy your holidays! Happy Holidays to all at NC. I hope Lambert takes some time off! Thanks to all at NC for all you do, much success for you in 2018!!! Bless you Yves, Lambert, Jerri-Lynn, Outis, Jules, and any NC support people I’ve neglected to mention. Thanks for all you do. Happy holidays to all! Yves, Lambert, Jerri-Lynn, Outis, Jules and the wonderful commentariat, thank you for all that you do, and all the best for the new year! Naked Capitalism has become my lifeline to sanity in a crazy world.